It's Day Three of the Newton's Nook Design May Release Sneaks and today we are introducing Papa Bear and it's coordinating dies. 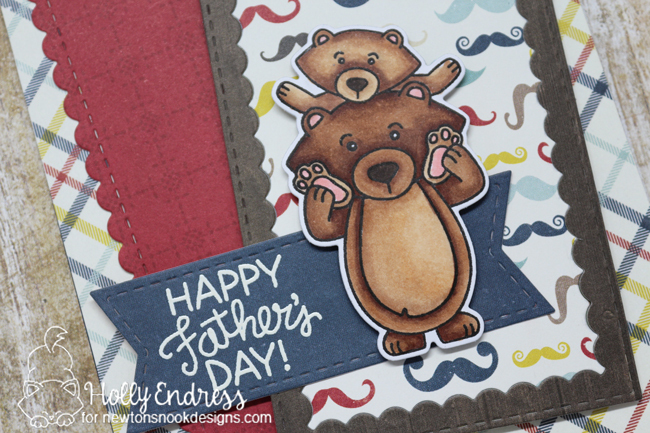 I used the new Framework Die to cut some pattern papers and then I stamped and colored the bear images with Copics. I arranged the papers onto an A2 Size card base and I used the large Banner die from the Frames and Flags Die set to cut a banner and I heat embossed the sentiment in White. I adhered the bear with some Foam tape and added some Fun foam to the pattern paper layers for height. This card has little coloring but you can create a big impact using patterned papers and Large Die sets like the Framework Die set. 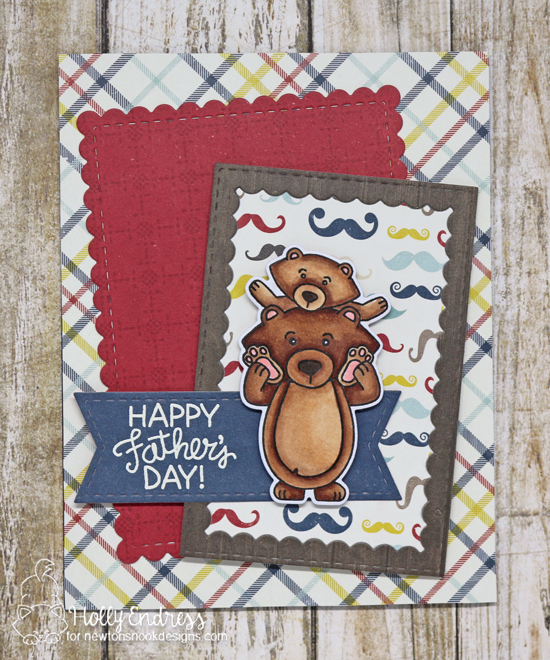 Would you like to win the “Papa Bear ” Stamp Set? Oh I really like this card! The color choices and background go really great together! A really fun card! Oh my!!! It's so cute!!! Adorable card!!! Love and these colors look amazing!! Fun images..great use of the moustache paper. This is a perfect Father's Day card. Love the patterns and colours. I love this card! It's fantastic. Very nice masculine card. Such an adorable Fathers Day card. So cute. I like the layers and choice of papers. Such a fun and happy card! Beautifully colored bears and I love your mix of patterned papers. Really cute card! Love the coloring on the bears! Love the layering and paper choices! Cute card! Cute!Thanks for the chance to win. Very sweet card. Love that die set. Love the papers you used and the colors! Definitely need more masculine stamp sets, this could be the one!!! Love the colors and the paper used. Winston is one of my favs and I'm low on masculine stamps sooo this might be something I need!! Super cute! I love the patterns you used with the bears!